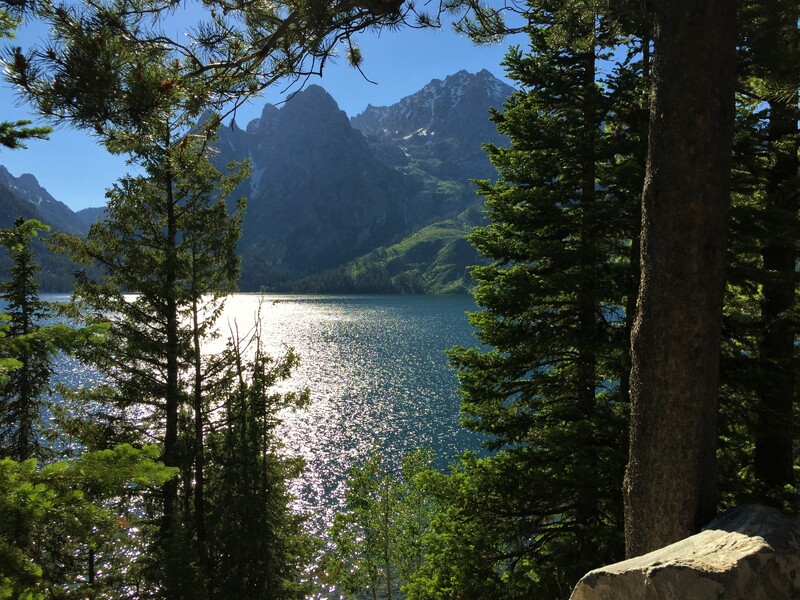 Planning on visiting Grand Teton National Park with your kids? Let us help make your planning easier! We had the pleasure of visiting Grand Teton in June of 2016. It was our first trip there, but will it definitely not be our last. We spent one day in the park, which now we know was not enough. This park tempts you to just sit back and enjoy the amazing scenery, but if your kids are like ours, they will not want to sit still very long. Grand Teton offers many activities to keep your family busy while enjoying the beauty of the park. 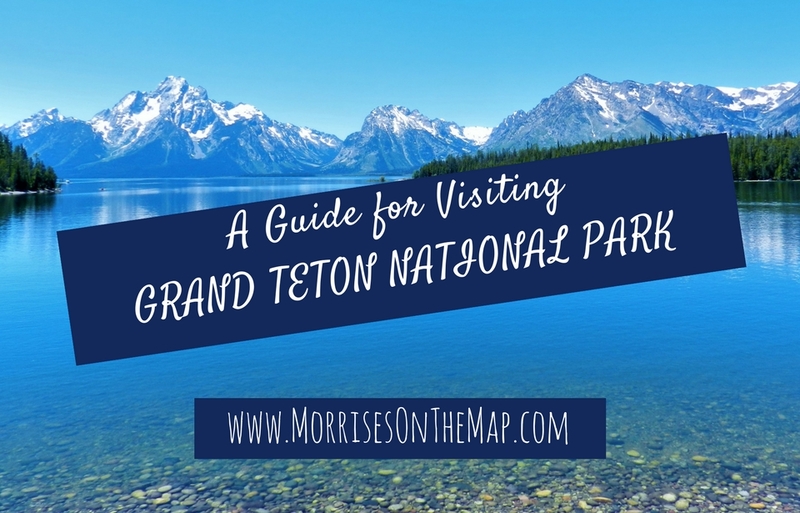 Here are 9 things you should add to your Grand Teton To Do list. Your first photo op of the day will be as you arrive at the park. 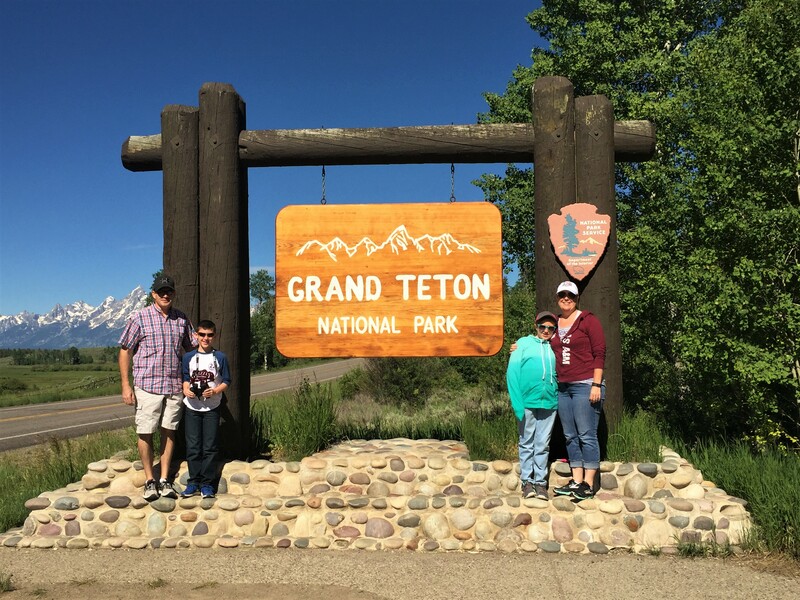 You probably will not be the only family stopping at the Grand Teton National Park entrance sign. We entered the park at the Moran entrance, and it had one of the prettiest signs we have had the opportunity to pose in front of. There is a parking area to make it easier for your family to stop and take a picture to commemorate your visit to the park. Depending on the time of year and time of day, you enter the park there may or may not be other families waiting to take pictures. One of the things we have learned is to offer to take another family’s picture. Every time we have done this, the other person has offered to take our picture. If you do happen to arrive at a time when no one else has stopped to take a picture, it is a good idea to have a selfie stick, or a tripod for your camera. Blaine laughed when I brought out the selfie stick for the first time, but he quickly realized how great it was! Be sure to tag us in any National Park sign pictures you take and share on social media.  We would love to keep up with your travels! It is always a good idea to start any National Park visit with a stop at a Visitor Center. These are great places to get ideas from Rangers, get Junior Ranger packets for your kids, stamp your National Park Passport and buy souvenirs. If your kids chose to complete a Junior Ranger book, they usually have to attend a ranger talk or ranger led hike. You can find a schedule for these at the Visitor Center. The Colter Bay Visitor Center sits on the banks of Jackson Lake. After getting any information you need, be sure to step out on the back deck. The view of the Tetons and the lake will take your breath away. 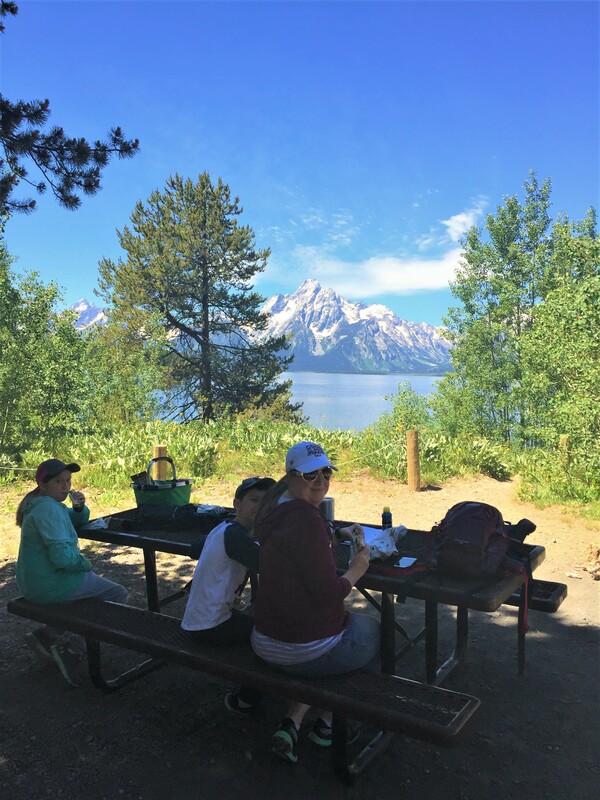 The Colter Bay picnic area is just down the road from the visitor center and is a perfect place to enjoy a picnic on the banks of Jackson Lake. Our very first hike in bear country was at Grand Teton. I was a little nervous about hiking with my kids and running into a bear. Blaine and I both had bear spray on us, but even still, I was just a little bit concerned. We decided the perfect solution was to take a ranger led hike. We went on the Swan Lake trail. This round trip 3 mile hike left from Colter Bay Visitor Center and took 3 hours. The kids really enjoyed this hike, because Ranger JJ taught them so much. We traveled through the forest, beside Jackson Lake and through sagebrush meadows. 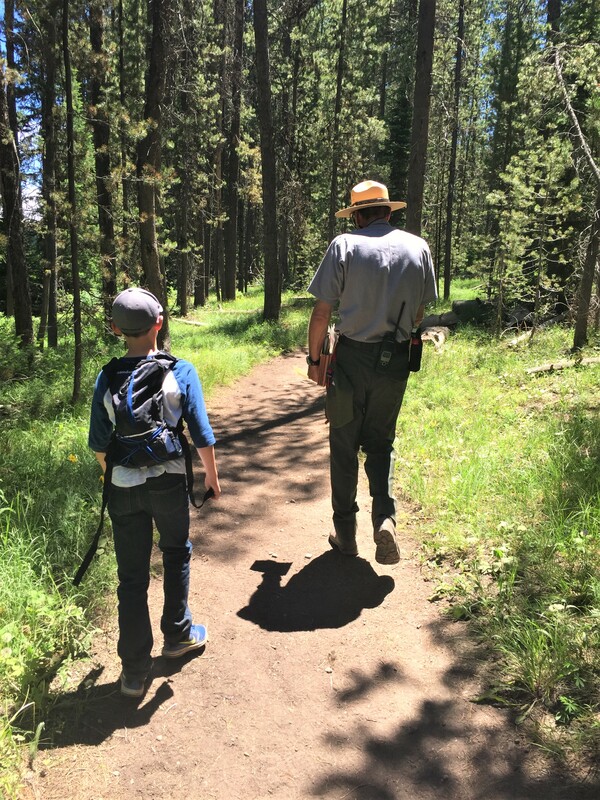 If this is your first time hiking in bear country or you just enjoy learning about nature and wildlife, a ranger led hike is a great option for you. The rangers can show you many things you would otherwise miss, such as bear claw marks on a tree along the trail…we all thought that was pretty cool! One of our greatest regrets is that we were not able to take the shuttle boat across Jenny Lake and hike to Hidden Falls. Due to a restoration project, access to the trail leading to Hidden Falls was closed and the Jenny Lake Visitor Center was in a temporary building. If you plan on visiting the park in 2017, you should check with a park ranger to see if the trail has reopened. You can still take a shuttle boat across Jenny Lake: adult$15 seniors (62+) $12, child (2-11) $8, under 2 years, over 80 are free. Once across the lake you can hike 1.1 miles to Hidden Falls or 2 miles to Inspiration Point. One day when we return to Grand Teton, these hikes are at the top of our to do list. Signal Mountain Summit Road is a 5 mile drive that provides several photo opportunities. At the summit of the road, you will be 800 feet above the valley floor and have a great view of the Jackson Hole Valley and the Teton range. Trailers and large motor homes are prohibited on this narrow road. String Lake, found in the North Jenny Lake area, offers several activities for your family. String Lake is another area we would like to spend more time on our next visit. This area offers a picnic area, as well as swimming in the seasonally warm waters. The sandy bottom lake is shallow and in many places you can walk all the way across. If you have a kayak, canoe, or paddle board, there is a launch area just past the String Lake Trailhead parking lot. If you are looking to do a little hiking, the String Lake Trail circles the lake through an area burned by a wildfire. This 3.3 mile trail will take you around 3 hours and is an easy trail for the family with a 120 feet elevation gain. No matter where you are in Grand Teton National Park you are likely to see wildlife. It is not uncommon to be stuck in a traffic jam because a bison or two are blocking the road. 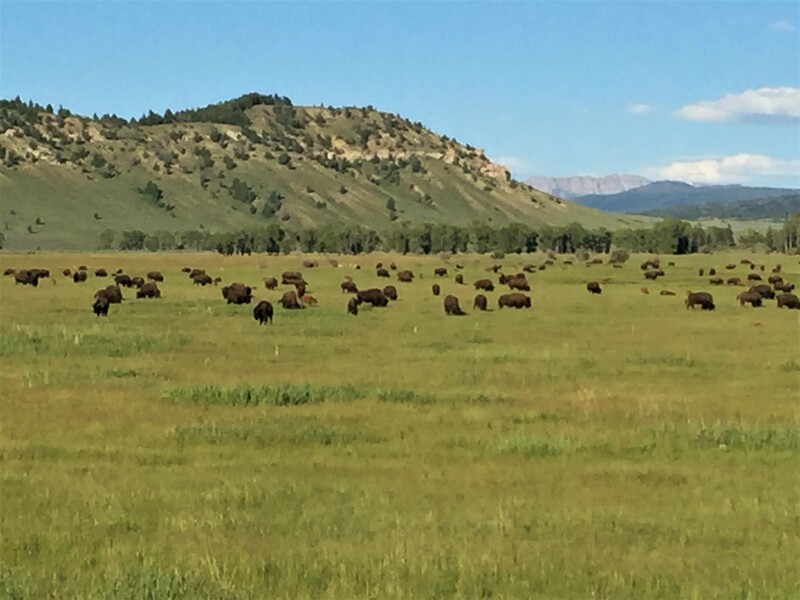 The drive from Moran Junction to Colter Bay is a well known wildlife viewing area. At the Willow Flats Overlook, you can often see moose grazing on willow shrubs. 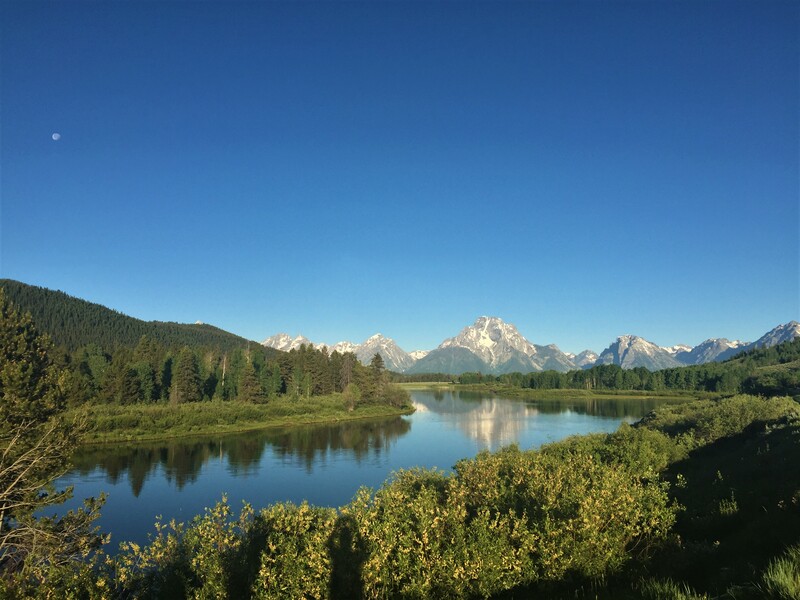 At Oxbow Bend Turnout, you could see river otters, bald eagles, ospreys and other birds feasting on fish. Grizzly bears can sometimes be seen looking for prey. Unfortunately, for us we did not see any of these, but we did see a lot of bison and elk while exploring the park. Wildlife Viewing Tip: Get binoculars for everyone in the family. Wildlife is not always close to the road and having binoculars on hand will make seeing animals far off a little easier. Wildlife does not always stand still and wait for the binoculars to be passed around so everyone can see. To avoid meltdowns, when someone does not get a chance to see an animal, provide a pair of binoculars for everyone if possible. Grand Teton is a beautiful park, and I hope your family will enjoy it as much as we did. Remember to make sure you take a picture at the entrance sign, visit the Colter Bay Visitor Center and take a ranger led hike. If the trail is open again, take the hike to Hidden Falls at Jenny Lake. Scenic drives offer great photo opportunities, and don’t forget to take a picture of the Moulton Barn on Mormon Row. (We regret missing this photo op due to our late in the day visit to Mormon Row!) As you drive and hike through the park, keep your eyes open for wildlife. If you get to all 9 of these things while visiting the park, you and your family will have a great Grand Teton experience! 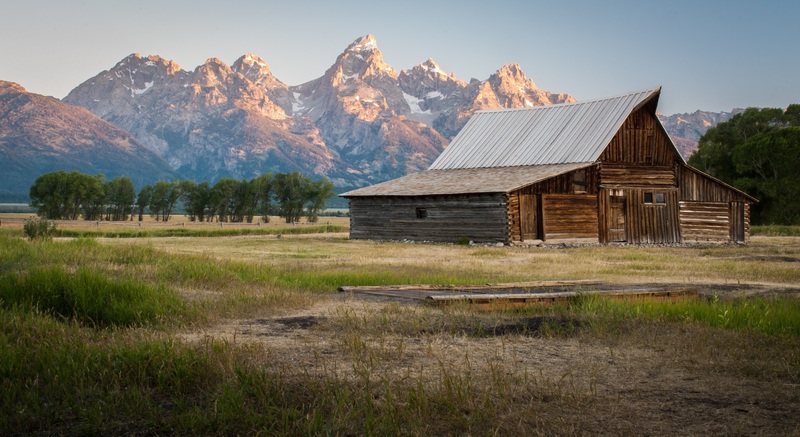 Are you going to visit Jackson, Wyoming or Yellowstone while visiting Grand Teton? 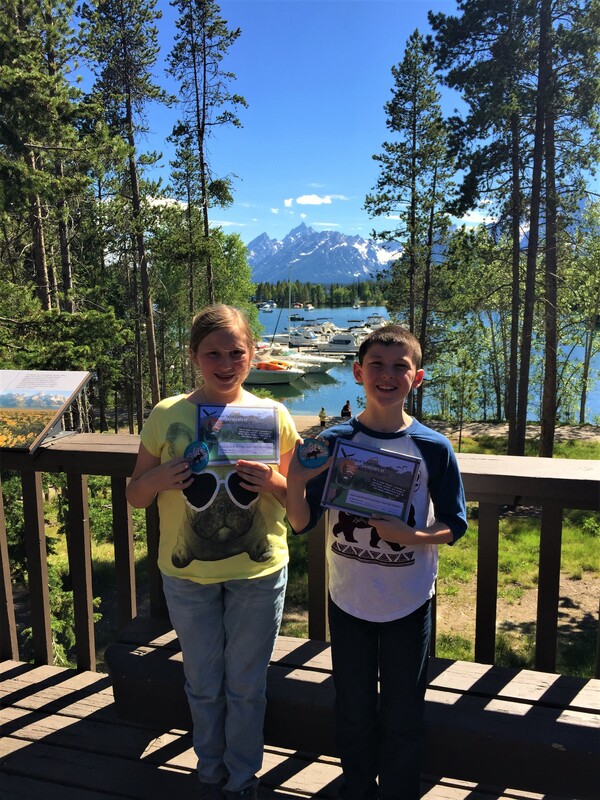 Be sure to check out A Day In Jackson Hole, Wyoming with Kids and 10 Things Our Family Loved About Yellowstone, Part 1. We would love to hear about your experiences at Grand Teton. Make sure you leave a comment below.